Why Is My Puppy Throwing Up? If your puppy is throwing up, something is wrong and it's up to you to figure out what, and fast. Vomiting in puppies is one of the most common symptoms of illness, both minor and major. It can also be caused by the very common puppy habit of chewing/eating everything that's not nailed down (and sometimes things which are). Ingesting all kinds of stuff they shouldn't generally doesn't cause more than an upset tummy, including vomiting and loose stools, but if toxins are involved or the object causes a blockage, the results can be deadly. Underlying illness, medications and parasites are also common causes of vomiting in puppies. This page should help you figure out what's causing your puppy to throw up, and what to do about it. Your first thought is likely to be whether your puppy is throwing up because he's sick, and about 80% of the time that's probably the case. 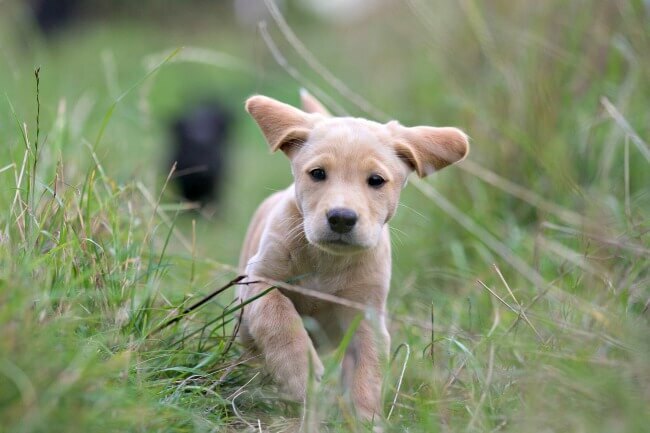 There are a number of different illnesses which puppies are at risk of contracting. How often is your puppy throwing up? If your pup ate something he shouldn't and it upset his tummy, he will likely vomit once, twice.. even three or four times (within a fairly short space of time) and then it'll stop. Throwing up which goes on, and on, and on... even well after your puppy is only bringing up liquid, or nothing at all is a sign of trouble. If little Rascal can't keep water down are he's in trouble because puppies even if he doesn't have a serious condition, he will get dehydrated quickly and dehydration alone can be fatal. Are there other symptoms in addition to vomiting? Vomiting and/or diarrhea are the two most common symptoms of illness in puppies, and lethargy (extreme fatigue) is number three. If your puppy is throwing up AND he also has diarrhea and seems extra-tired, then the odds of him being sick increase. Is your puppy acting differently? This isn't as odd a question as it might sound. Obviously while your puppy is throwing up, he'll look upset and obviously isn't feeling great, but whether or not Rascal bounces right back to his normal self after he's emptied his tummy is a big clue to what's going on. 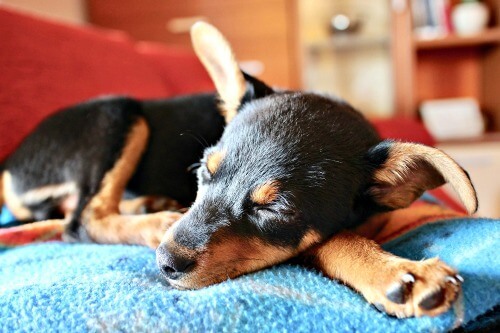 If you've had your puppy for a couple of weeks or more you'll have a good idea what his normal behavior, energy level, appetite and so on look like. Any unusual behavior such as clinginess, panting, pacing, whining etc. If your little guy seems generally his normal happy and playful self, has a normal appetite and doesn't seem to be unduly upset by his digestive problems then hopefully he's not sick. But... be vigilant and watch for any other signs of trouble. He could still be in the early stages of illness and if he doesn't seem back to normal within 24 hours a vet visit is needed so you can figure out what's going on in his belly. Has his diet changed or is he on medication? A sudden change in diet can cause your puppy to have an upset stomach. The most common reaction is diarrhea, but a puppy throwing up due to a new food or treats, or too many tid-bits can happen. Some medications can cause digestive upset, including both vomiting and diarrhea. In young puppies puppy deworming medicines are often a culprit. What Does Your Puppy's Vomit Look Like? If your puppy is throwing up and you're not sure why, you can often find some clues in the vomit itself. Is his food clearly recognizable? If it looks like Rascal just ate it, then threw it back up, it may be that he ate too fast, drank too much water at the same time, or ran around like crazy with a full stomach. This type of vomiting usually happens soon after eating, which is why the food isn't digested. Is there partly-digested food in your puppy's vomit? 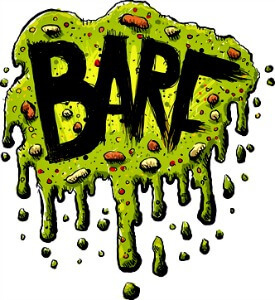 Food that is mostly sloppy/soft is partly digested was in his tummy for a while before being vomited back up. This could be due to illness, or to a simple tummy upset. It's not definitive either way. Is there soil/grass/sticks/pieces of a toy/paper/plastic etc. etc. etc in his vomit? The list is pretty much endless and curtailed only by his imagination and access. If there's a significant amount of odd/inedible stuff in Rascal's vomit chances are that's what is making him sick. Is there blood in it? When there's blood in vomit, it most often looks like dark granules, often described as looking like coffee grounds. If you notice anything that looks like this it means your puppy may be bleeding in his digestive tract, that requires a vet visit right away. Is there mucus in it? Mucus is a sign of inflammation in the digestive system. This can be a result of disease, a food or other substance/object which has irritated the lining of the stomach or intestines, or due to food poisoning or some underlying health conditions such as Pancreatitis. Is it mostly liquid? 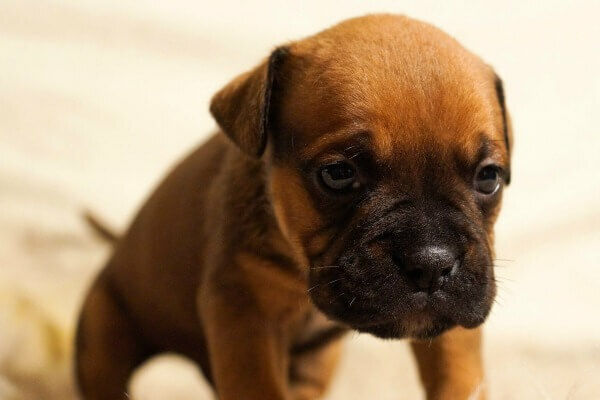 If your puppy is throwing up liquid either he has already vomited up any food in his tummy, or it was fully digested before he started to feel ill. Liquid vomit is more likely to be a sign of illness than the kind which contains food, or partly-digested food. What color is your puppy's vomit? If little Fido vomits up a yellow or yellow/green frothy liquid, it's possible that he simply has a too-empty tummy. This is especially true if your puppy is throwing up first thing in the morning or several hours after a meal. But yellow or clear liquid vomit can also be a sign of serious illness, including Parvovirus and liver, pancreas or kidney problems. Also check little Rascals poop! When a puppy is throwing up he often has loose stools too, pay attention to what's coming out both ends when you're looking for clues. If your puppy is throwing up it's always better to err on the side of caution and be safe, rather than sorry. The only time I would personally suggest taking a 'wait-and-see' attitude is IF Rascal has only vomited once or twice and otherwise seems his normal happy, active self and is eating and drinking normally. In this situation you can usually give it 12 - 24 hours and see if things return to normal. But take your puppy to the veterinarian right away if he continues to vomit, if he gets diarrhea, or if he shows ANY other signs of not feeling well or is acting in a way that isn't normal for him. In addition to the obvious, and urgent, dangers of poisoning there are several very serious illnesses that count vomiting as a symptom. 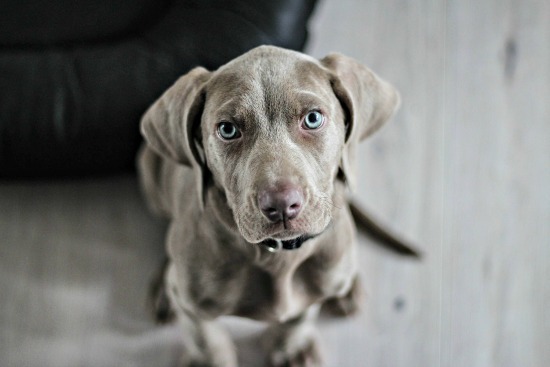 Diseases which are dangerous for puppies include Parvovirus, Coccidiosis and Giardia... all of which are very common in puppies and potentially deadly if not treated quickly, and properly. If you think your puppy ingested something toxic, call the ASPCA Animal Poison Control Center on 1-888-426-4435 or 1-800-548-2423 (there is a charge for this service but you can't put a price tag on your puppy's life!). There's also an app. that you can use anywhere and it's a great resource to have access to at any time to keep Rascal safe. Check it out here... ASPCA Animal Poison Control Center App. Can I Treat My Puppy's Vomiting At Home? In young puppies who are showing any other signs of illness the answer to this question is 'No'. Don't take any chances, have your little Rascal examined by a veterinarian to rule out contagious illnesses such as Parvo, as well as toxins or an intestinal blockage. The only time you can take care of a puppy who's throwing up at home is if the vomiting is mild and Rascal is behaving normally otherwise, with no other signs of illness. Fasting a puppy who has been throwing up gives his digestive system a chance to take a break, and can speed up a return to normal. For very young puppies, and for tiny breed pups, twelve hours without food is enough. Puppies over 12 weeks of age (as long as they're not tiny/toy breeds) can usually go twenty-four hours. After the fasting period is up, offer plain, boiled white rice with a little low-sodium chicken broth as a first meal. If that stays down and is well tolerated, you can give him a second meal of the same thing after 4 - 6 hours. If everything is still A-OK then you can give Rascal his normal food mixed with rice for the next meal and then return to his previous (normal) diet and schedule. If your puppy is throwing up it will put him at risk of dehydration. If he also has diarrhea, that risk is even higher. Dehydration in puppies is dangerous and if it gets severe can lead to organ failure, and even be fatal. So, make sure that little Rascal has access to all the fresh, clean water he wants and encourage him to drink small amounts regularly. Don't let him drink too fast, or guzzle down a gallon, this is likely to make him throw it back up pretty quickly. Adding a little low-sodium chicken broth to his water dish can make it more interesting for him if he seems fairly disinterested otherwise. If you find he can't keep water down and vomits it back up then he needs to be examined by a veterinarian right away. Canned pumpkin (NOT the pie-filling variety) is a great natural remedy for diarrhea which often accompanies vomiting in puppies. Adding a tablespoon of canned pumpkin to his meals for a day or two can help regulate his stools. Pepto-Bismol is generally considered safe to give for minor stomach upsets in dogs. But it's important to check with your veterinarian first because there are situations where it's not appropriate. The recommended dosage is 5ml (1 tsp) per 20lbs of body-weight, given every six to eight hours. If you don't see improvement after three doses, or you notice any blood in little Rascal's vomit or in his stools stop giving the Pepto and take him to your vet to be examined. Practical puppy care tips that make taking care of your new furry family member easy and fun. Everything you need to know about training, diet, health care & more. Get off on the right paw here. MyWay LLC participates in the Amazon Services LLC Associates Program & may earn advertising fees via links to Amazon.com A small commission may be received from all affiliate links and third-party advertising.